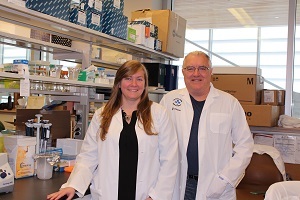 Bell’s research is supported by generous donors to The Ottawa Hospital. This study was also supported by the Canadian Institutes of Health Research, the Terry Fox Research Institute, the Canadian Cancer Society, the Ontario Institute for Cancer Research, the Ottawa Regional Cancer Foundation, BioCanRx and the Alliance for Cancer Gene Therapy. Maraba virus therapy was jointly pioneered by Dr. John Bell (The Ottawa Hospital, University of Ottawa), Dr. David Stojdl (Children’s Hospital of Eastern Ontario, University of Ottawa) and Dr. Brian Lichty (McMaster University). Drs. Bell, Stojdl and Lichty founded a company called Turnstone Biologics which is advancing the development of the virus. Turnstone did not fund the research described here. Bell is also the Scientific Director of BioCanRx, Co-leader of the Immuno-oncology Translational Research Initiative at the Ontario Institute for Cancer Research and founder of the Canadian Oncolytic Virus Consortium. The research described here was published in Science Translational Medicine on January 3, 2018. The publication is titled “Neo-Adjuvant Oncolytic Virotherapy Before Surgery Sensitizes Triple-Negative Breast Cancer to Immune Checkpoint Therapy”. The authors are: Marie-Claude Bourgeois-Daigneault, Dominic Guy Roy, Amelia Sadie Aitken, Nader El Sayes, Nikolas Tim Martin, Oliver Varette, Theresa Falls, Lauren Elizabeth St-Germain, Adrian Pelin, Brian Dennis Lichty, David Francis Stojdl, Guy Ungerechts, Jean-Simon Diallo and John Cameron Bell. The paper is featured on the cover of the journal, together with a similar study on brain cancer from a different group.